The twenty-three marble relief portraits over the gallery doors of the House Chamber depict historical figures noted for their work in establishing the principles that underlie American law. They were installed when the chamber was remodeled in 1949-1950. 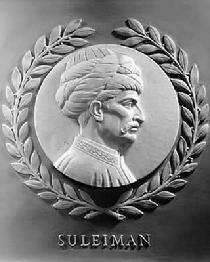 "Sultan of sultans, conquerer of three continents, Suleyman I shook the world of sixteenth century as he raised the Ottoman Empire to the height of its glory. Known to Europeans as the Magnificent and to his subjects as the Law-giver, he was both a brilliant military strategist and an acclaimed legislator. 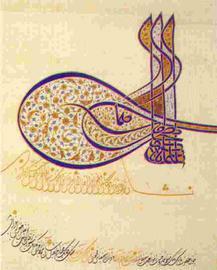 His imposing monogram, the tuğra endorsed the many edicts imposed during his 46 year reign." 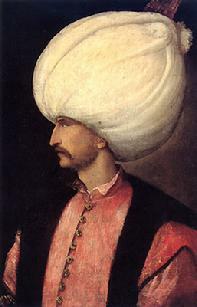 SULTAN SÜLEYMAN, by unknown Artist 16 C.
S�LEYMANİYE, THE MASTERPIECE SİNAN BUILT FOR SULTAN S�LEYMAN, IN THE 16.CENTURY.